Future House Publishing, 9780615654492, 299pp. When eleven-year-old Guster Johnsonville rejects his mother's casserole for the umpteenth time, she takes him into the city of New Orleans to find him something to eat. There, in a dark, abandoned corner of the city, they meet a dying pastry maker. In his last breath, he entrusts them with a secret: an ancient recipe that makes the most delicious taste the world will ever know--a taste that will change the fate of humanity forever. Forced to flee by a cult of murderous chefs, the Johnsonvilles embark on a perilous journey to ancient ruins, faraway jungles and forgotten caves. Along the way, they discover the truth: Guster is an Evertaster--a kid so picky that nothing but the legendary taste itself will save him from starvation. With the sinister chefs hot on Guster's heels and the chefs' reign of terror spreading, Guster and his family must find the legendary taste before it's too late. 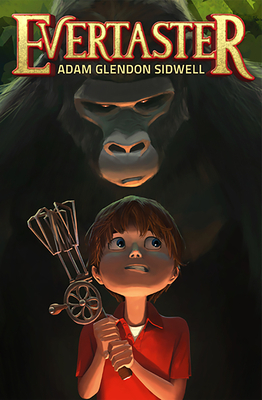 Adam Glendon Sidwell graduated from Brigham Young University with a BFA in Animation and emphasis in Computer Science, after which he began a career as a Creature Technical Director building CG creatures for feature films such as Pirates of the Caribbean, King Kong, Pacific Rim, Tranformers, and Tron. He and his family currently live in Utah. He is the author of the Evertaster series, the picture book Fetch, and Chum.